In our fallen world, invisible toxins like doubt, disappointment, and discouragement can contaminate even the strongest of faiths, leaving behind symptoms that affect our entire being--body, mind, and spirit. 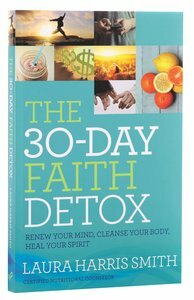 Using a one-month detox structure, spiritual wellness expert and certified nutritional counselor Laura Harris Smith uncovers 30 universal faith-toxins that affect us all. Each day you will discover Scripture, prayers, and faith declarations to cleanse yourself spiritually and emotionally with truth and a biblical perspective. In addition, she includes a simple, corresponding nutritional cleanse using detoxifying foods from your own kitchen. Prayer by prayer, thought by thought, day by day, refresh and refuel your faith and bring healing to the whole temple--spirit, mind, and body. About "The 30-Day Faith Detox: Renew Your Mind, Cleanse Your Body, Heal Your Spirit"
Laura Harris Smith founded Eastgate Creative Christian Fellowship with her husband, Pastor Chris Smith, and directs the Creative Arts Conservatory. An actress, playwright, poet, and media dynamo, she was TV host on the Shop at Home Network for many years. This is her first book. She and her husband have six children and live in Hermitage, Tennessee.